2. 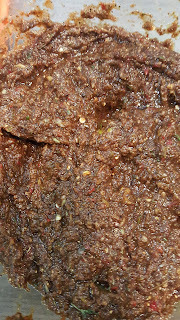 In a food processor, whizz the garlic, ginger, scotch bonnet peppers and spring onions to a puree. 3. Add all of the dry ingredients to the food processor, along with the thyme leaves, honey, soy sauce and lime juice and whizz to combine. 4. Pour the marinade into a big bowl then add the pork and massage into the meat. I recommend wearing gloves when handling scotch bonnet peppers. Leave to marinate overnight in the fridge. 5. An hour before baking, take the pork out of the fridge. 6. Pre-heat the grill to high. 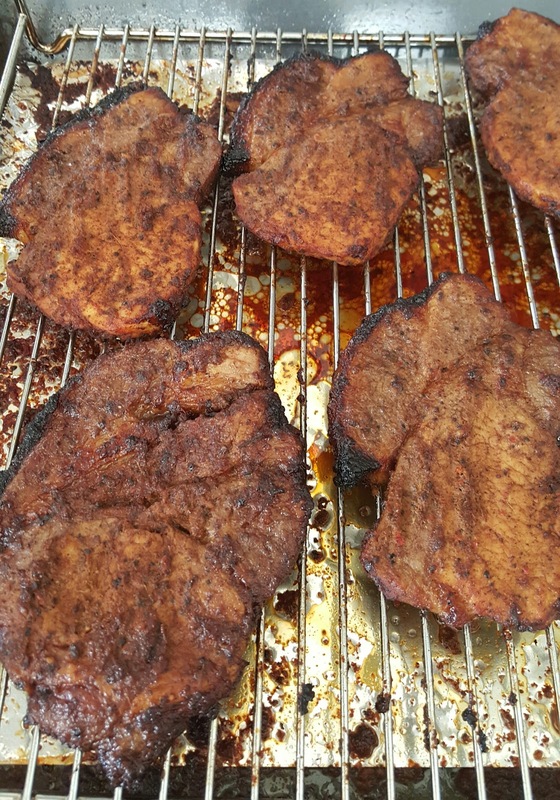 grill the pork for 16 minutes, turning every 4 minutes or until cooked. I served the pork steaks with home made oven chips. I took my wife to Bennetts for her Birthday breakfast. The restaurant is situated on the balcony of Bennetts department store on Iron Gate Derby. 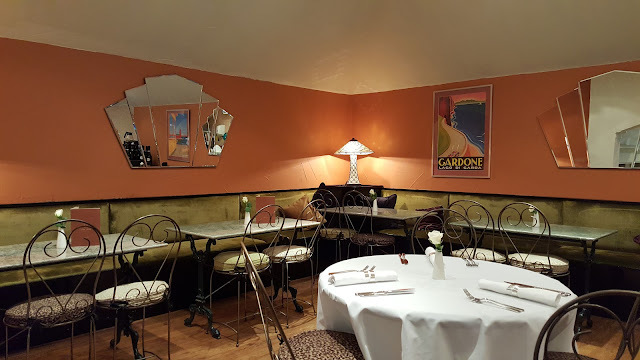 Decorated in Art Deco style, it's a quirky place where you can see your food being cooked in the open kitchen. 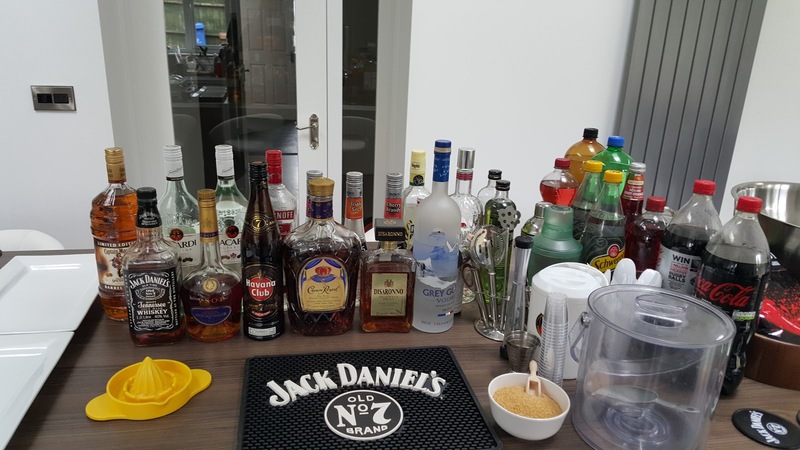 The Brasserie is also licensed to sell alcohol. 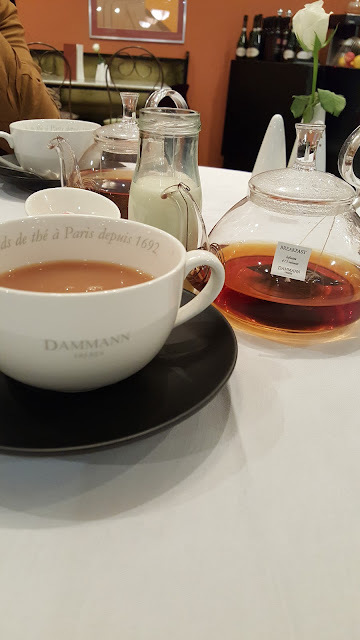 We ordered a pot of tea each (£2.45). 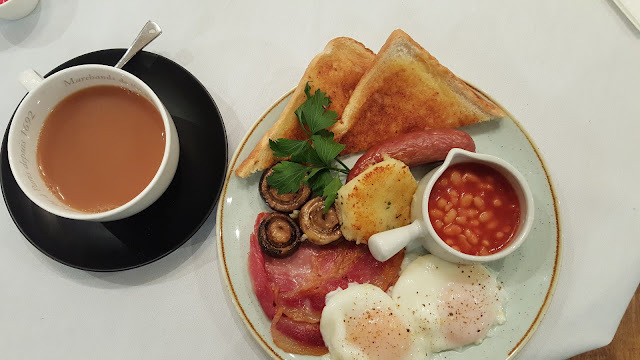 We both ordered the Small breakfast (£6.95). 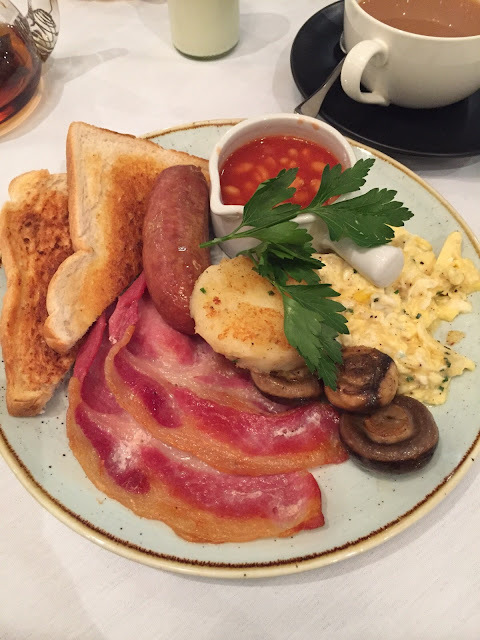 You get one sausage, two rashes of bacon, a slice of toast, potato cake, mushrooms, baked beans and eggs "the way you like". I opted for poached eggs and my wife had Scrambled. You can tell they use good quality produce and the breakfast is perfectly cooked and presented nicely. We would both describe this as one of the best breakfast spots in Derby. A great place for breakfast, more silver spoon than greasy spoon. The service was great and the staff friendly throughout the store. The only issue is that there is no lift so we carried the pushchair up to the restaurant. We went out for dinner with friends. 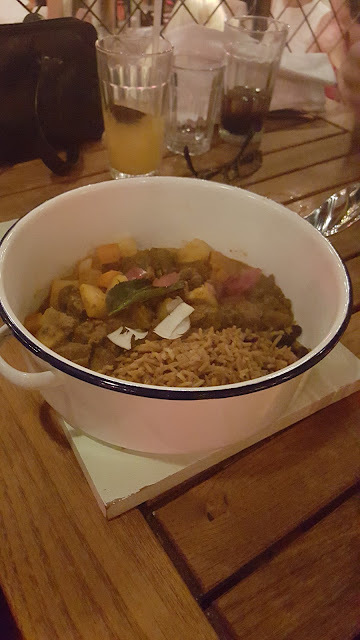 I have been to Turtle Bay in Nottingham and Leicester and I enjoyed the food, so was so excited when this opened up in Derby. 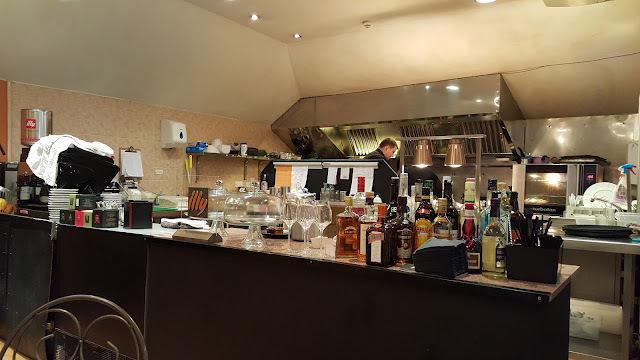 The food and drinks were great at every previous visit. Like the others in the chain, the decorations are really playful and cool. I love the speaker wall with the rum bar neon sign. 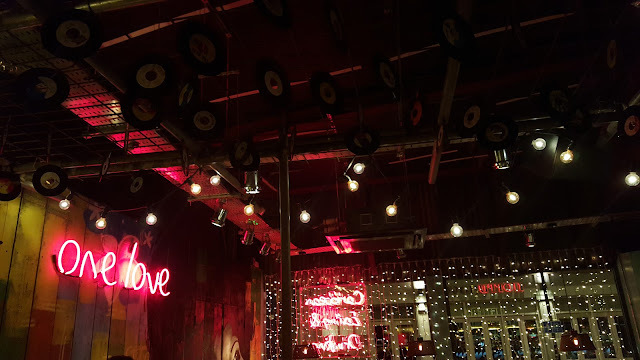 Turtle Bay has great music and a chilled vibe. We went on a Thursday, and the restaurant was not overly busy. The service was very slow, we waited an age for our order to be taken and just as long to receive our drinks. 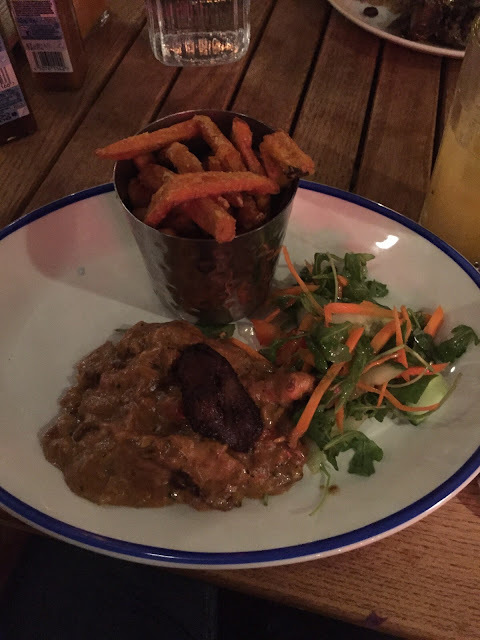 I shared the Jerk Pit Prawns (£5.95) with my wife. 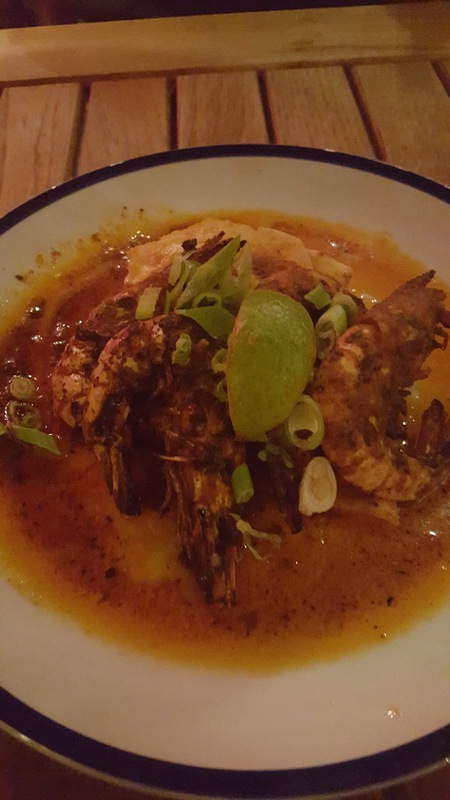 They are whole shell-on jerk pit grilled king prawns, herb, chilli & garlic butter, flatbread. These were divine. A messy, tasty dish with a great sauce and the spring onion and lime give it a fresh finish. Our friends shared the Jamaican Fried Bait (£4.95). A Lightly spiced & crisp whitebait with fresh lime & coriander mayo. I tried some, and these were too "fishy" for me, My wife did not even want to try them because of the smell. 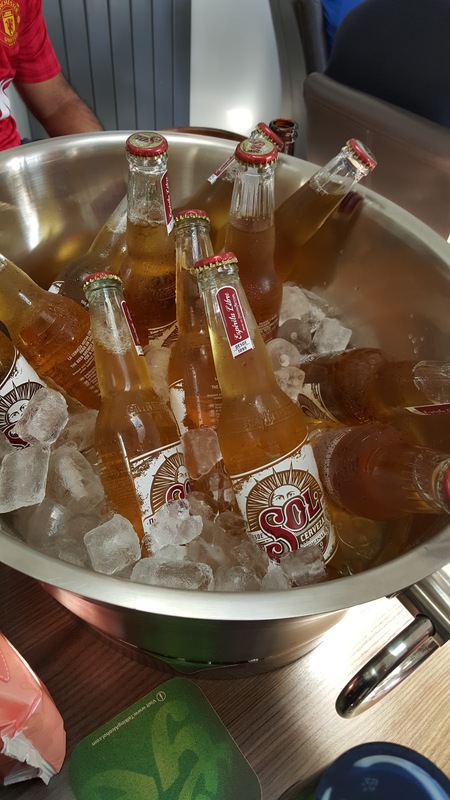 Our friends liked them, so it just comes down to individual taste. I had the Jerk Lamb £12.50 which is Grilled jerk marinated & glazed lamb steak, fresh green seasoning, Caribbean slaw & sweet potato mash (I replaced the mash for "rice 'n' peas"). The dish was average. The lamb was tender and the green seasoning gave it a fresh taste. 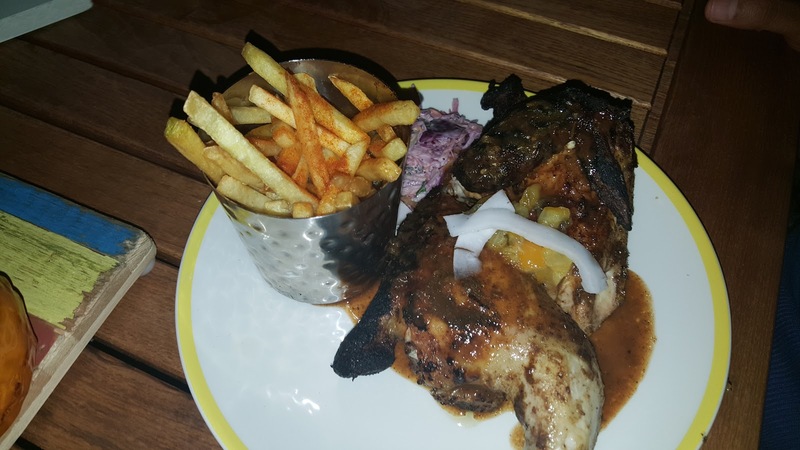 Chicken breast, creamy jerk spiced sauce, onions, plantain and dressed salad. With rice ‘n’ peas, sweet potato mash or sweet potato fries. She chose the sweet potato fries. 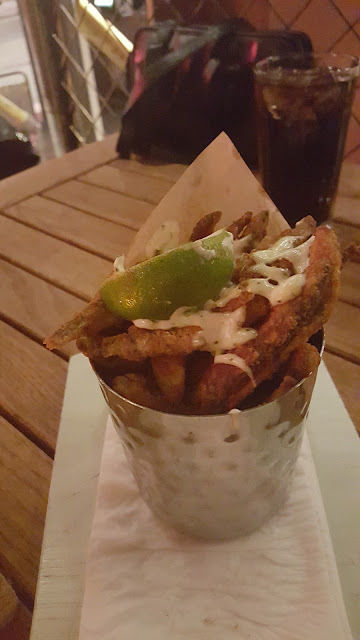 The fries were crispy. The presentation was average. The dish was however nice and creamy with just the right amount of jerk flavour. It's the taste that counts and she said she would have it again. Marinated goat, potatoes & carrots, rice ‘n’ peas, sweet onion chutney & flatbread. We loved the presentation. The dish was nice (I had a cheeky taste). 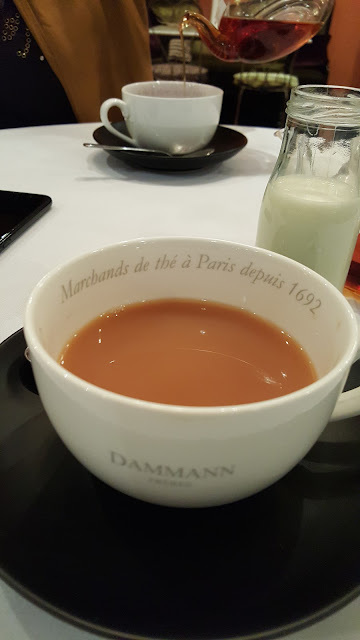 I would have ordered this but I had it last time in Leicester. 12 spice & herb jerk marinated & grilled, sour orange chutney and Caribbean slaw. With rice ‘n’ peas, sweet potato mash or sweet potato fries. There is a fine line between perfectly charred and burnt, unfortunately this one was the latter. For my Jerk Chicken recipe see here. It was a good sized portion and tasted nice. I prefer a bit more "kick" in my food so was glad to have the hot sauce on the table. 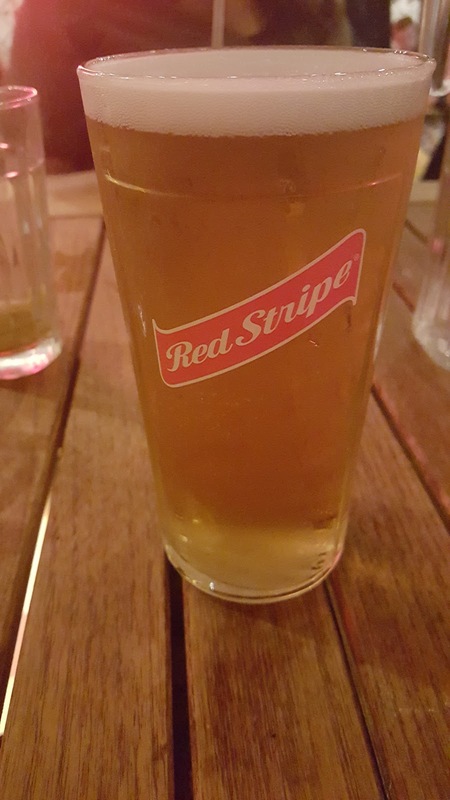 I enjoyed a nice cold Red Stripe (£3.95) with my meal. The delay described above, actually worked in our favour. We managed to hit the 10.00 p.m. happy hour. 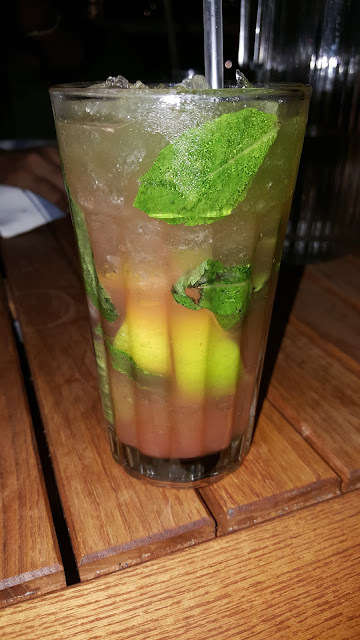 I do love the cocktails at Turtle Bay, and love them even more during "happy hour". 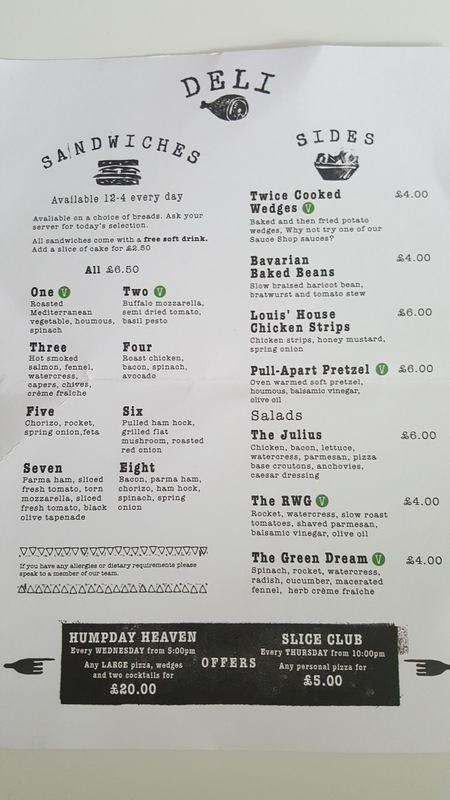 We had the Marley Mojito (£6.95) Appleton Special rum, Midori, fresh mint & watermelon, home-made ginger beer (2-4-1 during happy hour). This was amazing! I loved it and will recreate it at home. We were all full, but both couples had a dessert each... it's rude not too! We ordered the brownies and ice cream. 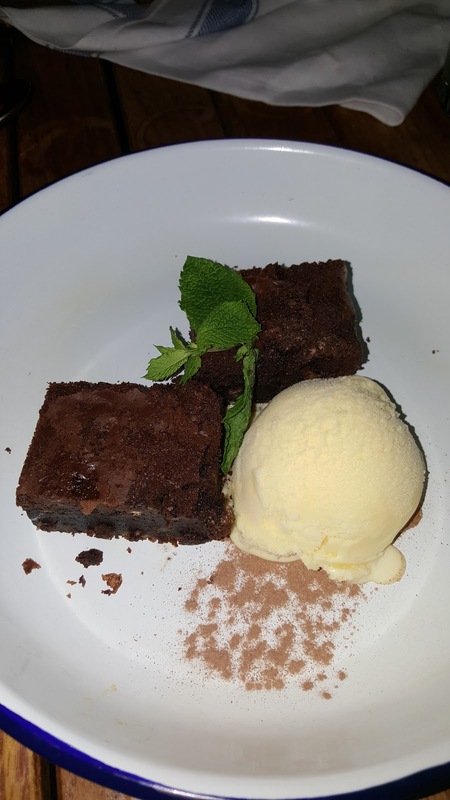 Brownies were average, the ice cream was nice. It's still early days at Turtle Bay Derby, I know it will get to the same level as the others in the chain. Will be back for some food and happy hour drinks soon. 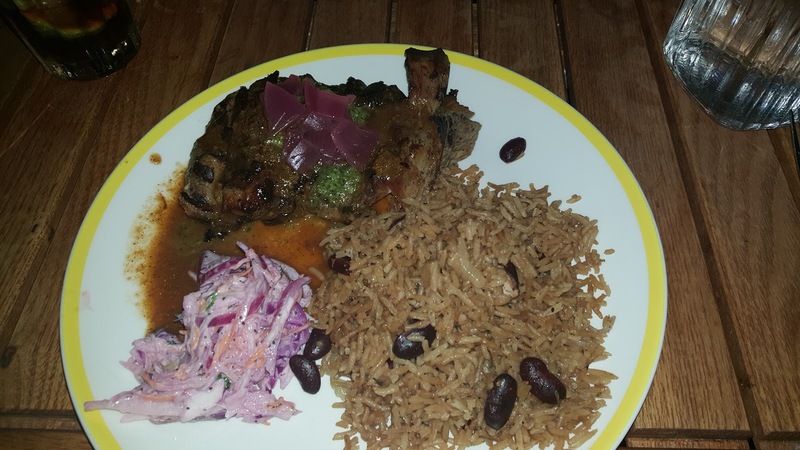 If you are familiar with any aspect of Caribbean food its probably Jerk. 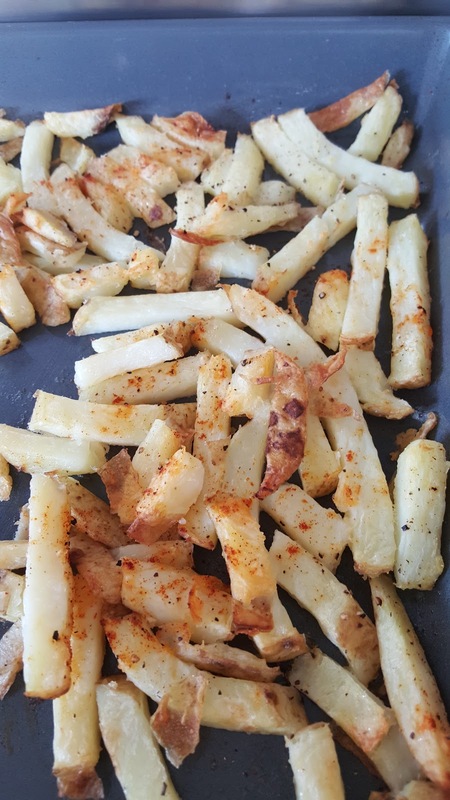 There are so many different recipes for Jerk out there, and this is mine. People say you only get the real jerk taste if you bbq the meat, the same can be said for tandoori chicken, which tastes best when made in a tandoor. 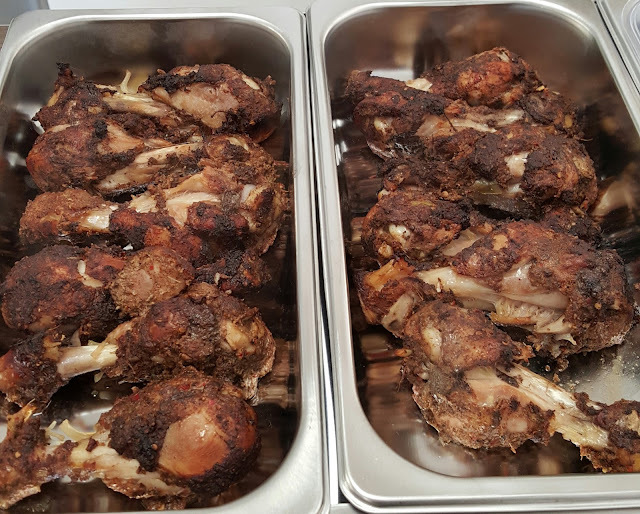 I made my Jerk chicken in the oven, we don't always have the bbq ready to go or a tandoor sitting in the corner. 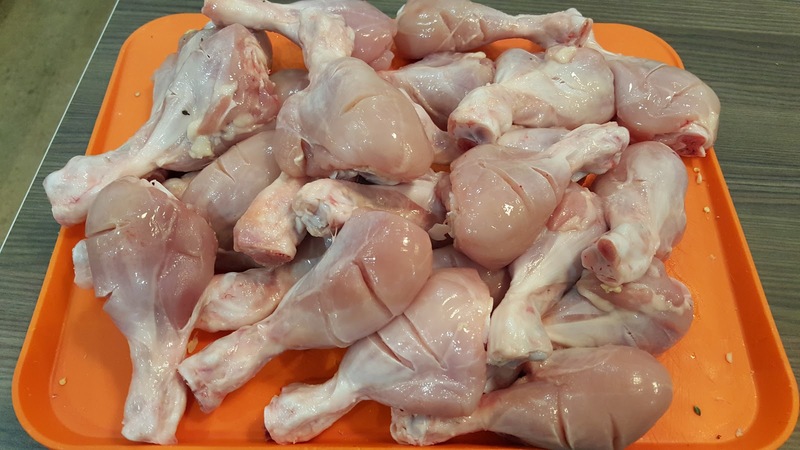 Chicken, either on whole chicken cut into 8 pieces, 6 chicken legs (thigh and drumstick attached), 6 thighs and 6 drumsticks or 12 drum sticks. Scotch bonnet peppers (1 for mild, 2 for a medium heat, 3-5 for a good kick) sometimes I go 1/2 a scotch bonnet per piece of meat. I used 6 for this recipe. On this occasion I used 24 drum sticks so I just doubled everything in the recipe. 3. Add all of dry ingredients to the food processor, along with the thyme leaves, honey, soy sauce and lime juice and whizz to combine. 4. pour the marinade into a big bowl then add the chicken and massage into the meat. I recommend wearing gloves when handling scotch bonnet peppers. Leave to marinate overnight in the fridge. 5. An hour before baking, take the chicken out of the fridge. 6. Pre-heat the oven to 200 degrees. bake the chicken for 25 minutes or until cooked, turn halfway through. The chicken was a success, the "heat" level was a point of debate, it was just right for some and far to hot for others. Either way the ice cold bears and drinks went down well with the chicken! 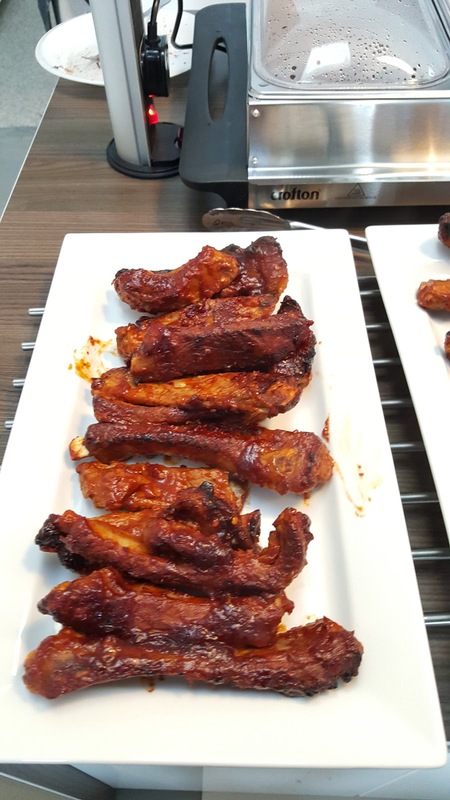 I did ribs for when a few mates came around to watch football last week. 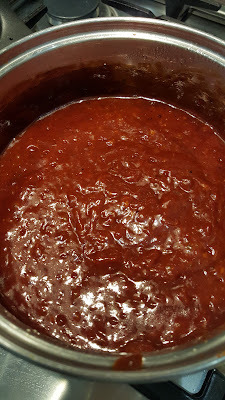 When doing this recipe I thought there is no point us using a ready made BBQ marinade, so I decided to make my own bbq sauce. My approach to recipes is read many, choose the bits you like form each, add some of your own judgement, taste, adjust and taste again. My wife was out so I could not use my usual sounding board so it was harder than usual. 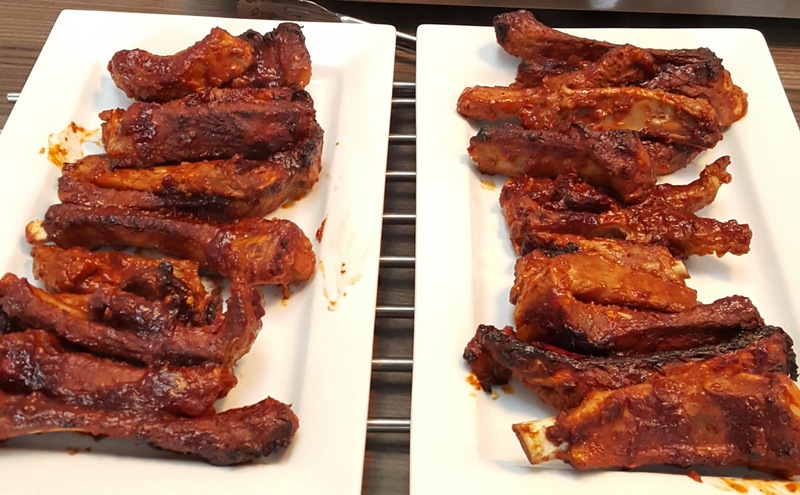 I used 1.5 Kg of pork ribs. 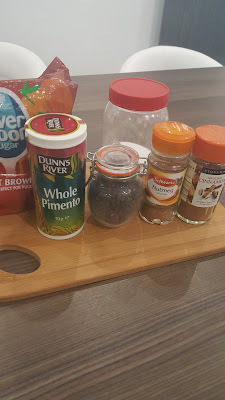 I put the ribs in a deep pot and covered them with water, added a onion halved, 2 crushed garlic cloves, 1 teaspoon black peppercorns and 2 green chillies sliced. 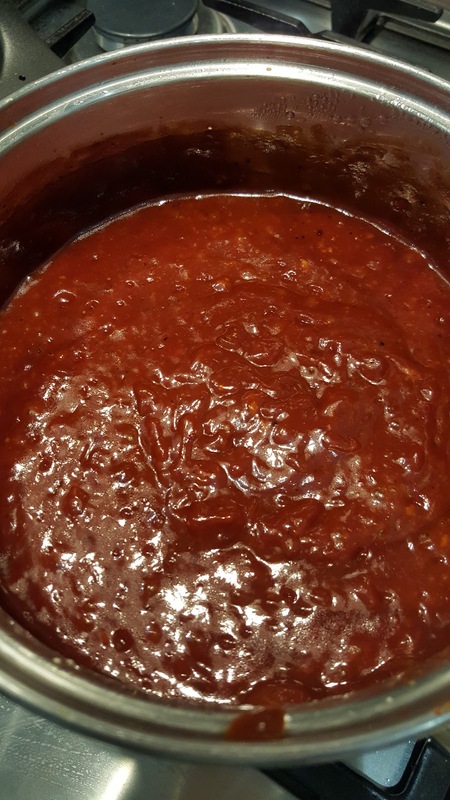 Put the heat on high, and bring to the boil, then let the ribs simmer for 45 minutes, or until the meat is tender. heat a deep pan until hot, add the oil, onions and garlic. Fry for 5 minutes, or until the onions have softened. 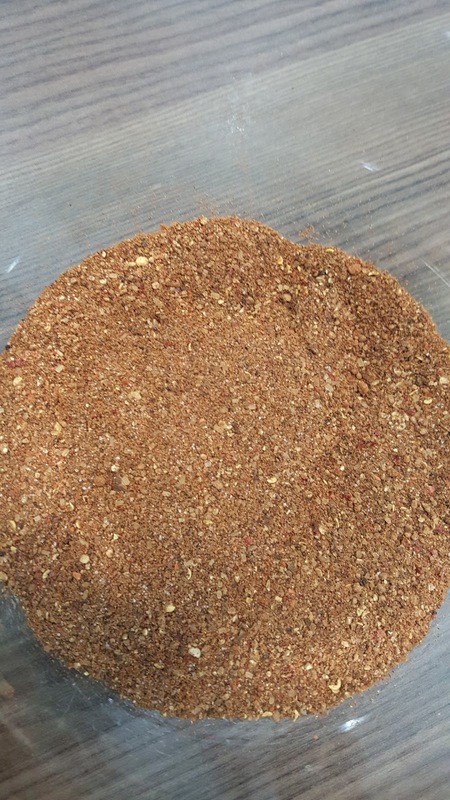 Add the chillies dried and fresh, cumin, brown sugar and cook for 2 minutes, until the sugar has melted. 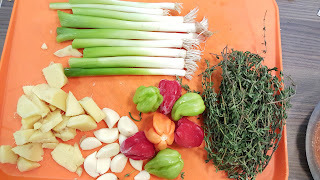 Add the rest of the ingredients, bring to the boil, reduce the heat and simmer for 10-15 minutes, until thickened. 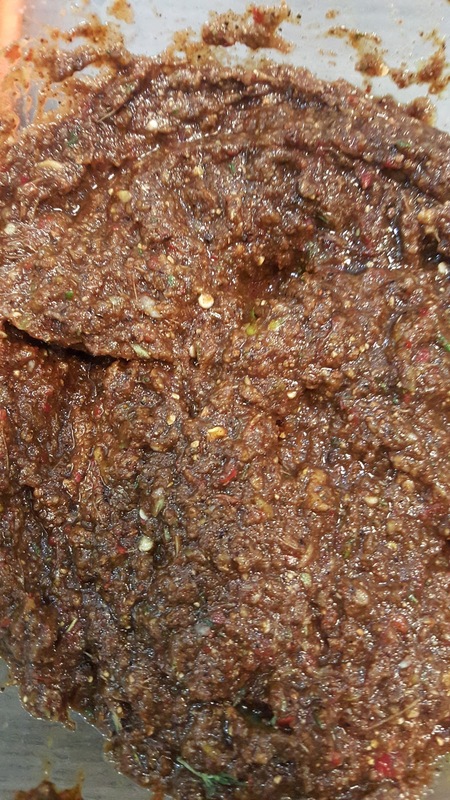 Remove from the heat, allow to cool and blend to a smooth paste in a food processor or using a stick blender. I then mixed half the marinade through the ribs and placed in the fridge over night. 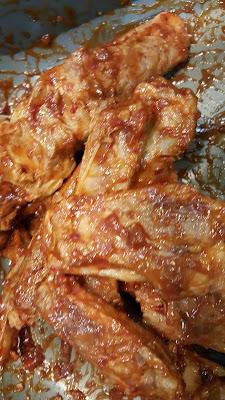 An hour before baking the ribs I took them out of the fridge. Pre-heated oven to 200 degrees. Placed the ribs in a blacking tray and covered with foil and baked covered for 20 minutes. I then basted the ribs with the rest of the bbq sauce and baked uncovered for 10 minutes. 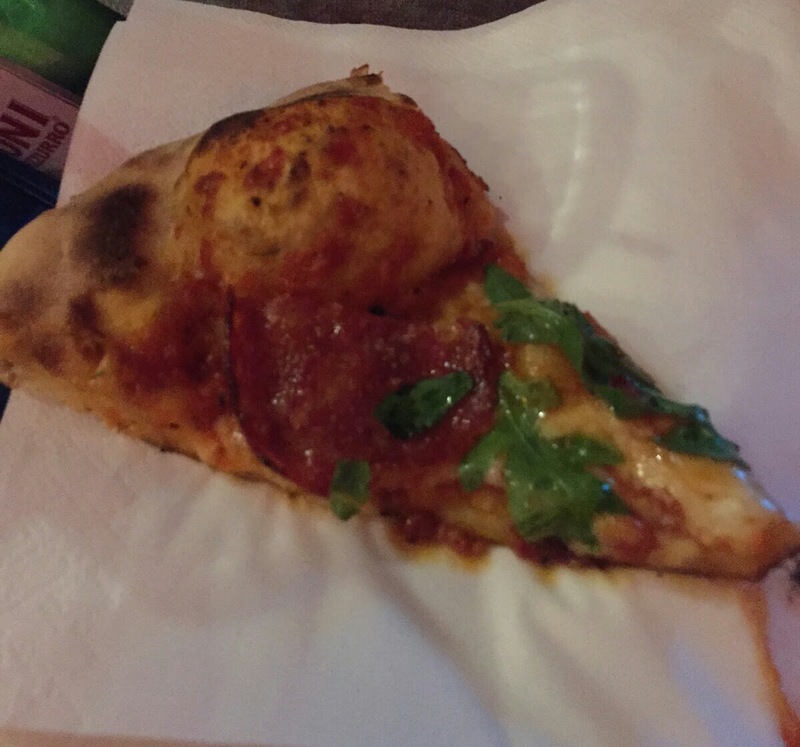 We were invited to the pre-opening night of the pop-up restaurant Louis Louis Pizza and Deli Emporium at Das Kino. The place was absolutely packed on the night we went. Having never been Das Kino before I did not know what to expect. The place looks great, its a stripped back industrial homage to German cinema. It has three table tennis tables, a copper bar and neon lights. I managed to bat a few stray ping pong balls back with the wooden clip board attached the menu I was reading. I will apologise now for the pictures they do not do the food justice, but in my defence it was very busy and we were standing. Dishes were going out for all to sample, and it was a good to try a selection of the dishes on the menu. 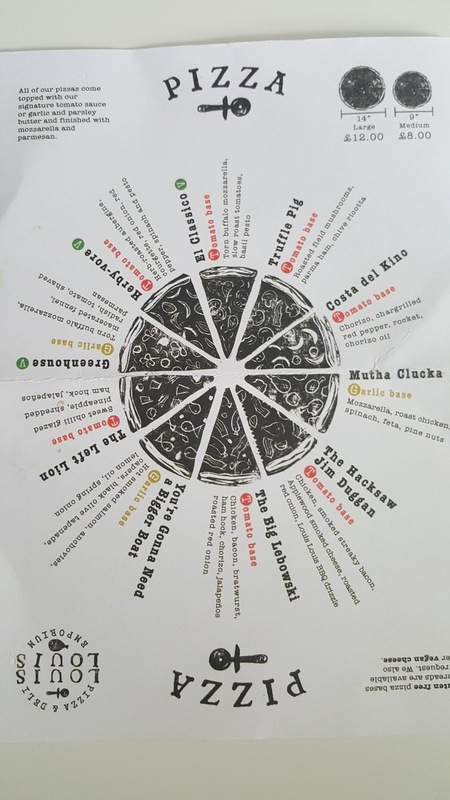 The first pizza we sampled was the Costa Del Kino. (14" £12.00, 9" £8.00) Chorizo, Chargrilled red pepper, rocket, and (homemade) Chorizo oil on the tomato base. WOW... this pizza was amazing. It would have been the one I would have picked from the menu if dining there. The toppings, sauce and thin and crispy base were a truly great combination and the chorizo oil and peppery rocket gave a fresh hit. 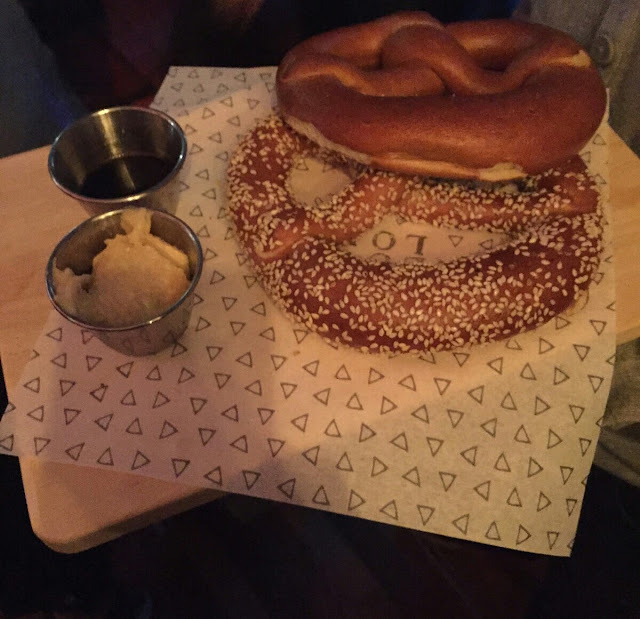 Next we were given the Pull-Apart Pretzel (£6.00), These are oven warmed soft pretzels served with houmous, balsamic vinegar and olive oil. These did what they said on the tin! They were warm, very soft and extremely light and extremely moreish. We also saw other ones go out with different toppings such as poppy seeds. Next we tried The Hacksaw Jim Duggan (you would need a two-by-four to prize this off me!). 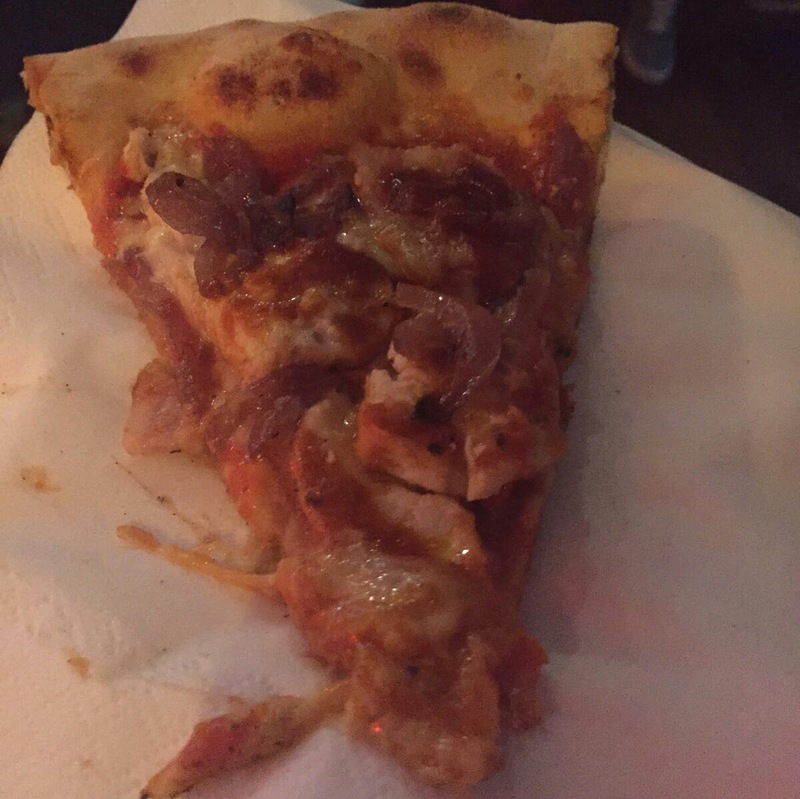 (14" £12.00, 9" £8.00) This has chicken, smoked streaky bacon, Applewwod smoked cheese, roasted red onion, Louis Louis BBQ drizzle. 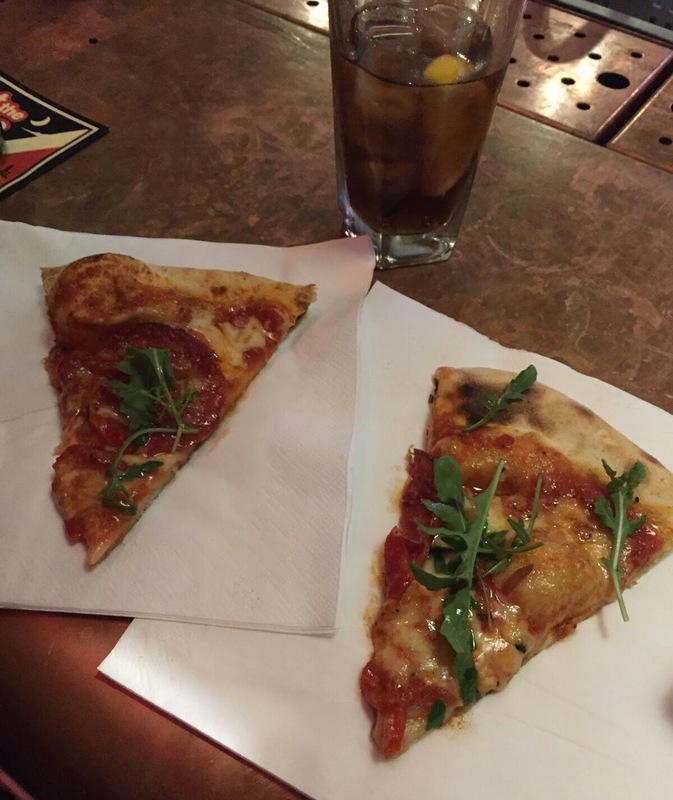 The Pizza's were coming out, consistently thin and crispy. I loved the combo on this one. Next we had the You're Gonna Need a Bigger Boat (14" £12.00, 9" £8.00). 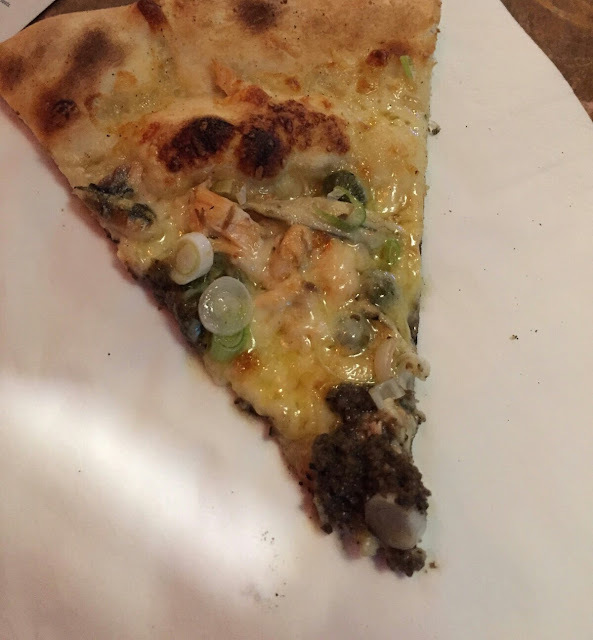 This pizza is on a garlic base and topped with hot smoked salmon, anchovies, capers, black olive tapenade, lemon oil and spring onion. This had one topping I did not like, anchovies. Apart from them it was really nice. I could have eaten lots of the tapenade. Was great when the Costa De Kino came around again. My wife said that Louis Louis served the best Pizza she had ever had... and I have to agree. We will come back here for a proper sit down meal. 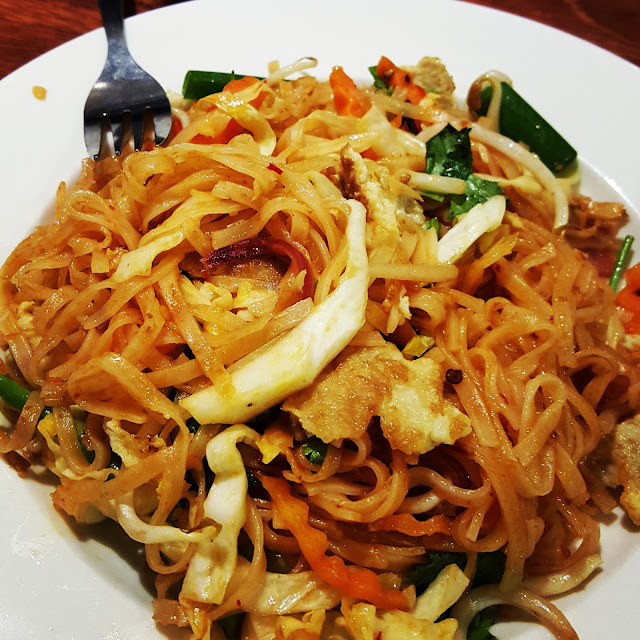 I visited Sasi's Thai following a recommendation from my sister. The food is authentic and tastes great. We ordered two dishes and shared them. I ordered the Pad Thai, and my wife ordered the Green Thai Curry. 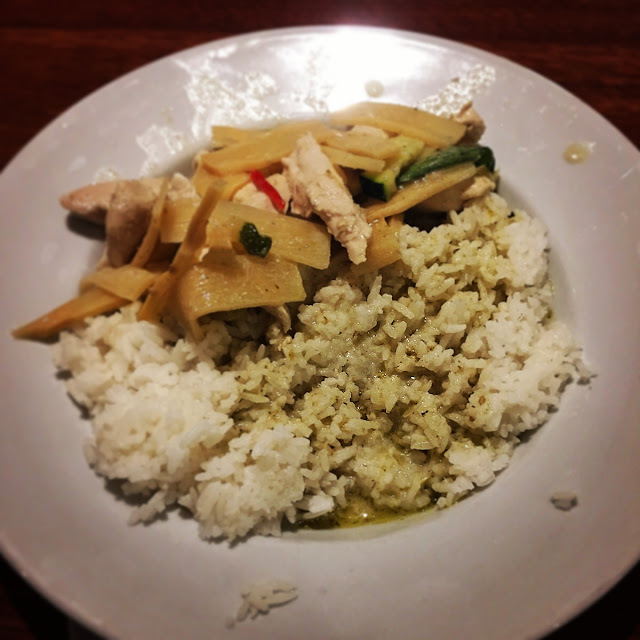 For my Green Thai Curry recipe see here. The cafe is in the covered market in Oxford. It was very busy at lunch so we walked around and browsed around the market. There are a selection of regular dishes including green Thai curry, yellow Thai curry, Pad Thai, chicken with cashew nuts and egg and pork curry as well as daily specials. Some times you just want cafe concept where you can just grab a quick causal great tasting meal without the restaurant ceremony. 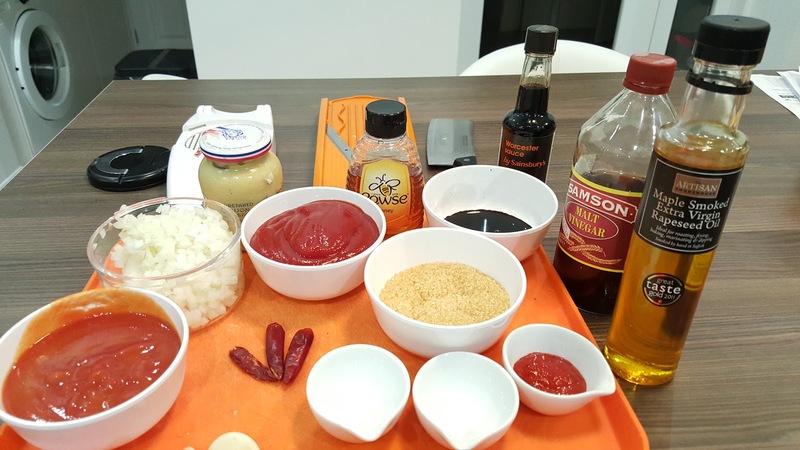 Sasi's also sells the many of the ingredients you need to cook the dishes your self at home. The staff are friendly, the food is great, cheap and the portions are big. We got both dishes for under £12.00. I have eaten many Pad Thai Noodles and this one is good. Its had the right balance of flavours. I have had a few in recently that were just too sweet. This one could have done with a sprinkling of peanuts, but i'm just being over picky! Even after the lunch time rush there was a steady stream of customers eating in and grabbing a take away. I will definitely be back here, the food is great. We stumbled across Ben's Cookies, whilst walking through the covered market in Oxford. We are so glad we did. 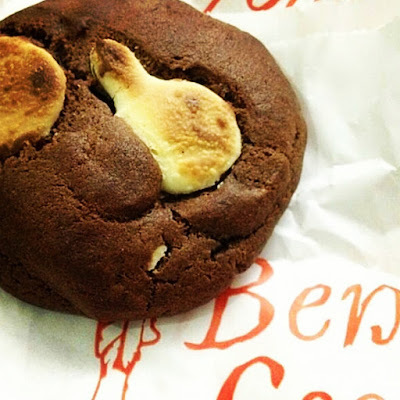 The cookies are big, soft, gooey and chewy! A deadly combination. There were score's of tourists and school children in the queue when we walked past so we popped off for a bite to eat on the promise I would take my son back if he ate all his dinner. There is an decent selection of 12 varieties, see the picture below for details. I went for the triple chocolate, as did my son. my wife went for the fruit and nut with milk chocolate. I sampled some of hers for reviewing purposes. 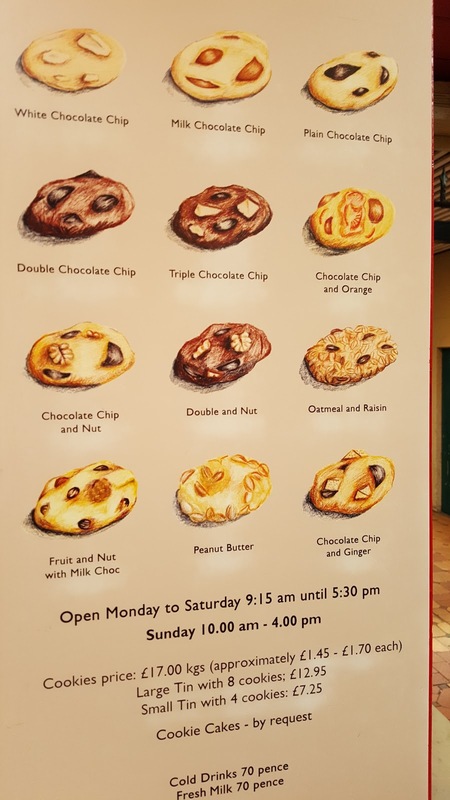 Great cookies and available at many locations but not the Midlands sadly. Not ever purchased the cookies by weight before, we paid about a fiver for 3 cookies. Worth every penny. Baking with chunks not chips since 1983. I needed a change form breakfast biscuits for my rush to work. Getting my 3 year old ready for nursery does not give me much time to eat at home, so I just grab the easy option. I have tried smoothies before and they fill you up for a couple of hours but that's it. After some research online I found lots of people use oats. 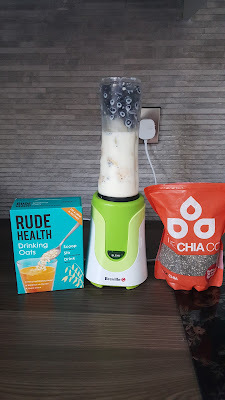 I did not fancy drinking cold "porridge". Then I came across drinking oats! 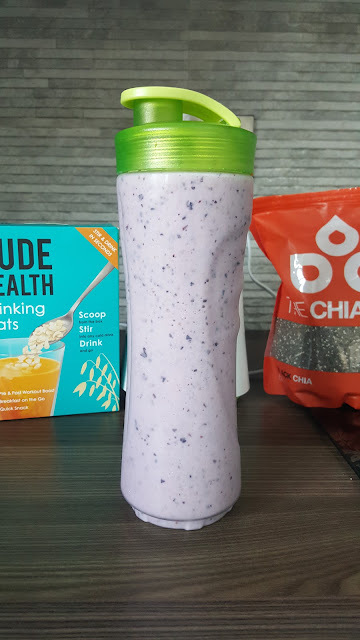 A quick blitz and the oats "disappear" and you are left with a thick smoothie. Method add all the ingredients in a blender and blitz to your preferred consistency. This is a really easy and refreshing salad. 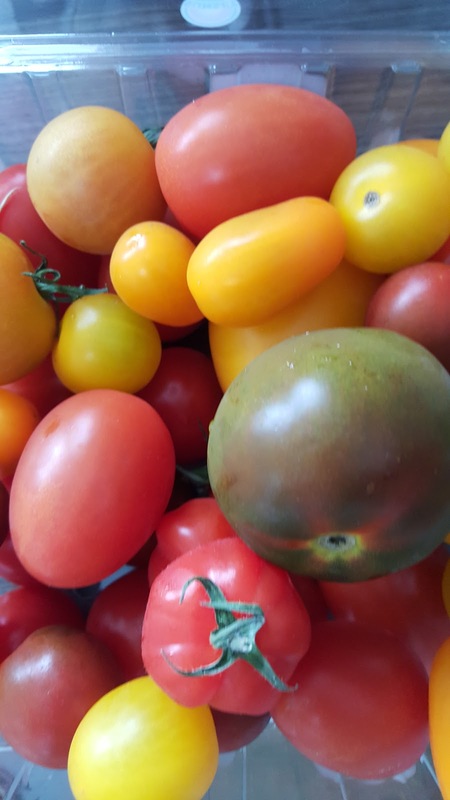 I used different varieties of tomato for colour but more importantly flavour. 1. Layer the tomato and basil leaves, place the mozzeralla and season with a couple of twists of seasalt and pepper. Drizzle over the olive oil. This makes a quick and easy meal for two. 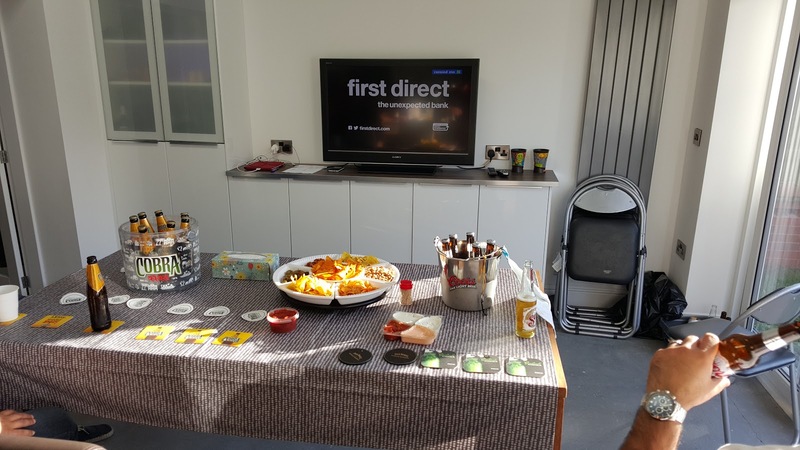 I had my family round and used it as part of a buffet. Probably one of the easiest things I have made in a long time, but it's so nice. 1. Poach the chicken (layer in a pan, cover with cold water add 1 teaspoon salt and bring to the boil. Turn down the heat, cover and simmer until the chicken in cooked, about 18 minutes). 3. Mix the chicken with 1/2 Jar of green pesto, and allow it to cool. 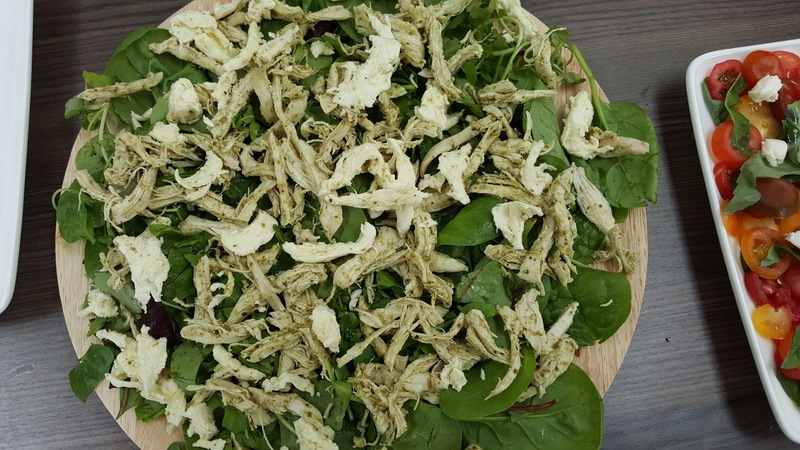 Layer the leaves, top with shredded chicken, tear and add the mozzarella. Drizzle over the olive oil and a twist or three of black pepper. 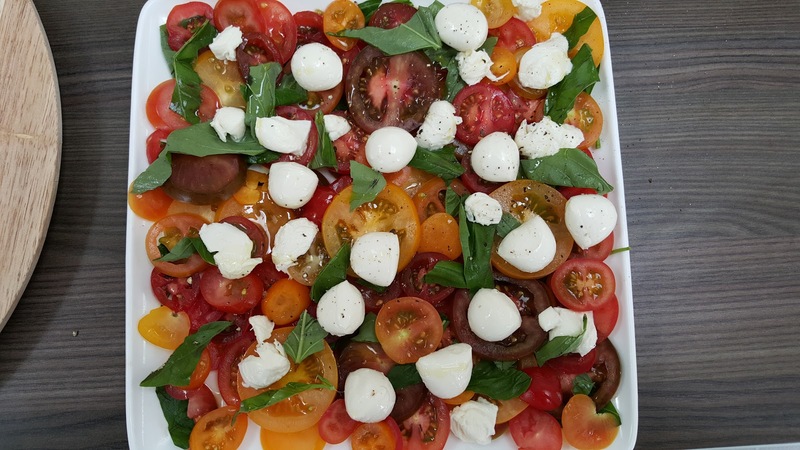 The other salad sneaking into the picture is a tomato, mozzerella and basil salad. The recipe is on the Blog.